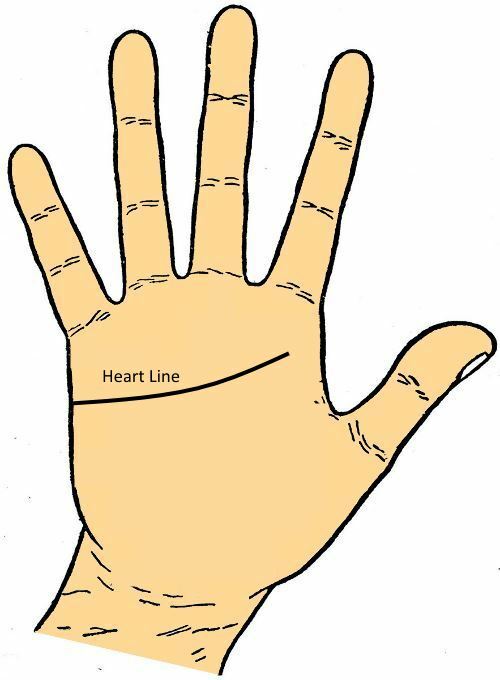 The Heart Line is the line which goes through the palm under your fingers. It normally appears under the bottom of the 1st finger and goes through the base or the bottom of 4th or the little finger (1-1). The Heart Line connects mainly to the loving nature. Actually, it is related to your love nature. It is located not over the Head Line. It is therefore on the part of the palm which connects with your mental features. It is not related with the physical characteristic. The Heart Line must be distinct, clear, deep and good coloured. It may start from the extreme out of Mount of Jupiter (2) or from the middle of this Mount or from the place in between 1st and 2nd finger (3) or from the face of Mount of Saturn (4) or directly under the Mount (5). If your Heart Line starts from outer part of Mount of Jupiter then it indicates that you have the blind affection to your love. You place your adoration so high that there is no chance of failing or fault in our love. You love your object very much. But the tragedy is that you may suffer more through your love. It is a rule of Destiny. From the middle of the Mount of Jupiter the Line of Heart provides much more self-control. It is one of the best variations of the line which are considered. If you possess this type of Line of Heart then you are reliable and firm in your affections. You have an extraordinarily high sense of morality and honour. You are ambitious. You are noble, great and successful person. These kinds of people seldom marry. They possess very few love affairs than the other classes. If you love one then your love for one’s remains constant. You do not believe in 2nd marriage. You do not suffer divorce usually. If the Line of Heart ascends in between 1st and 2nd fingers of your hand then your nature remains very focus in every matter of affection (3). You like to strike the cheerful medium between the pride and idealist provides by Jupiter. If it rises from the Saturn then your nature of love may be very selfish. You are not very warm in the love affairs. But you are able to sacrifice for the person you care for. You do not anticipate for the person for whom you confer you affection to be goddess or a god. If the Line of Heart ascends on Mount of Saturn then you may be selfish in types of affection (4). You are not unselfish people. You have the tendency to be cynical, undemonstrative and reserved. You are very adamant to gain the love you want. Normally you may not stand in your way. But if you gain your love then you may show your softness and devotion to your love. You are not one who pardons one’s partner if one’s partner commit mistake. But as you are “a law unto yourself”, you close your eyes to your own faults. If the Heart Line ascends under the base of Mount of Saturn (5) then it shows all the previous features, but with much more strengthen form. You may live for yourself. You do not care others who are around you. If your Heart Line is small then your sentiment may be less. If your Heart Line is excessive long then it indicates that you possess an inclination towards the jealousy (2). In addition, if the Head Line is very much sloping to the Mount of Moon (6) then your chance of jealousy may be increased in alarming position. In this case, your imagination may flee with itself in respect of jealousy. If the Line of Heart is observed bending to the down at the bottom of Mount of Jupiter (7) then it indicates that you may meet with the strange fatality. You may meet with huge disappointment in your love affairs. You may suffer even in the case of friendship too. It looks that you have lack of perceptual experience. You do not know whom to adore. Your affection is always gone astray. You as a fact possess wonderful and affectionate nature. You possess little pleasure about whom you love. Normally you marry beneath your station in life. If your Heart Line is formed like a chain or many little lines going through into it then it indicates that you have a tendency of flirting. You are inconsistent in your love. You are hardly able to last your affection. If the Line of Heart is appeared from Mount of Saturn in the holes or connects like a chain, particularly if it is broad then it indicates a complete dislike for your partner. This is one of the indications of mental collapse as your adoration is concerned. If the Line of Heart is broad and pale and does not possess depth then it indicates a relaxed nature. You are indifferent in affection. If the Line of the Heart is very low on your palm and about touching the Head Line then your heart may interfere with the head affairs all the time. If it is situated upper part of your palm and the space is lessened just by the Line of Head is strangely high and out of the location then it denotes that your head rules the affairs of your heart. You are very calculative in love affair. 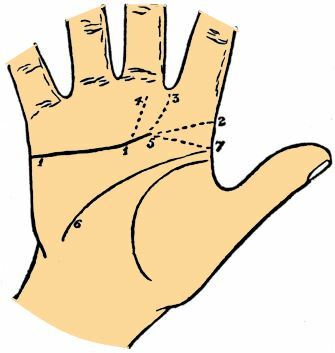 If only solitary straight and deep line is observed around your palm from left to right then Line of Heart and Line of Head mix together. It indicates a strong self-focusing characteristic. If you love then you unite it with your mind’s all forces. If you put your mind on anyone then you show the complete dedication to this person. You are also extremely obstinate and determined in what you do. You do not know what the meaning of fear in any situation is. You are precarious lovers and husbands to play with. If your blood once incites then nothing can stop you. You are dangerous to yourselves also. You hustle blindly into the danger. Normally you meet with severe injuries and accidents. Frequently you suffer from a sadistic death. If the Heart Line starts with a spilt, one branch goes through the Mount of Jupiter and another in between the 1st and 2nd fingers then it is a fantastic mark. It indicates that you may spend a happy, well-balanced life. If your Heart Line is very slim and does not possess any branch then it indicates that your heart is cold and you want someone or something in your life. If you do not possess the Line of Heart then it is an indication of an unemotional disposition and cold-blooded. You may brutal in nature especially when the Mount of Venus is elevated. If you possess a broken Line of Heart then it denotes that your life may be devastated by terrible tragedy. You may never recover from the loss of your love. You may hardly fall in love 2nd times in your life.